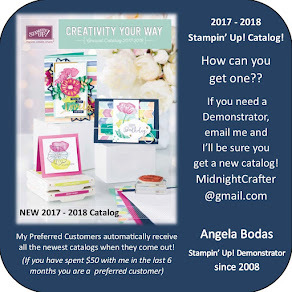 Its fun to mix and match stamp sets, and luckily so many of Stampin' Up! stamp sets 'play well with others'! LoL But sometimes, keeping it simple has its advantages! This note card set, for example, uses one stamp set and one Designer Paper Series Stack with minimal embellishment - but has optimal impact! Its pretty easy to guess the theme of this Designer Series Paper Stack, what with all the cake and ice cream and candles and balloons: It's A Birthday or Party type stack. So I thought I would get good use out of it by pairing it with the Endless Birthday Wishes stamp set. And yes. Endless Options! Wheeeee!!! I started with a card that would show off a bunch of those party prints, this panel card with strips of different paper. On the back of some of the bolder prints are the subtler and more "background" type prints, perfect to use as the panel base. I picked several patterns I liked - they all go together, that's the beauty of the Designer Series Paper Stack: It coordinates with itself wonderfully! I cut pieces of the 4.5 x 6" sheets into 0.75" x 6". For this card I couldn't quite get 2 cards out of it, because it uses slightly more than half when I placed the strips at an angle. But I liked the look, and I have lots of paper! I stacked the strips at an angle up the card, using Snail to stick the strips down. Once they were stacked I stamped my greeting across the top. I turned the panel over and trimmed off the excess parts of the strips. 2" x 6" strip of paper will cover the envelope flap easily. Add rows of Snail Adhesive for a secure stick. Add your strip and smooth it out. Trim the excess off with scissors. 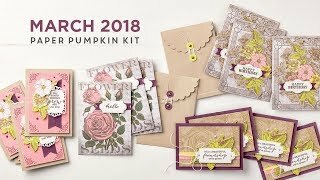 Hope you are inspired to try your own, these are an easy way to get a bunch of cards done in a short amount of time. Perfect for all those summer events! What Paper and Stamp Set duo are you going to try?